Avail from us an impeccable assortment of high quality Gypsum Powder that is a hydrated calcium sulphate (CaSO4.2H2O). It occurs mostly in bedded deposits. Three varieties of it are known. One of them is transparent other is fibrous and the last one is massive and compact variety. Variety which is massive porous and admixed with clay and sand is known as gypsite. India has large reserves for gypsum. Over 90% of the reserves are located in Rajasthan Also this states accounts for over 90% of total production. Rajasthan gypsum is mostly of gypsite type found in bedded deposited. From the natural gypsum, marine gypsum is recovered while evaporating brines and phosphor gypsum as a by-product from the phosphatic fertilizer plants. Gypsum is widely used in manufacturing of cement. It acts as retarder, controlling the setting time of cement. 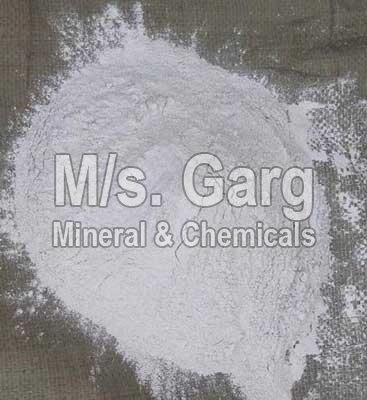 Gypsum free from coloring matter and of high purity is used in manufacturing of white cement. It is used as fertilizer. Fertilizing Corporation of India use natural gypsum in manufacturing of ammonium sulphate. In the manufacturing of P.O.P., ceramics and distemper gypsum of transparent variety is used. Surgical plasters also require gypsum having purity of 90 %. It is also used as soil conditioner for absorption of moisture and nitrogen. It is utilized for carving and statuary purposes. Large quantity of gypsum is used in the manufacturing of wall plasters, partition blocks, tiles, stucco etc.